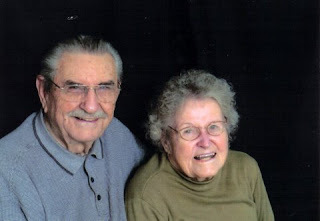 Retired missionary to Africa Dorothy Goodman (pictured with her husband, Marvin)went to be with the Lord at 4:20 Sunday morning at Grace Village Retirement Center, Winona Lake, Indiana. She and her husband Marvin served with Grace Brethren Missions (later GBIM) in the Central African Republic for 42 years, beginning in 1945. Dorothy, a well-loved leader in the women’s work, also served as guest house hostess in Bangui, CAR, in their final years on the field. A complete obituary will be posted when available. Calling will be Friday, March 13, from 2-4 p.m. and 6-8 p.m. at Redpath-Fruth Funeral Home, Argonne Road, Winona Lake, Indiana. Memorial service will be 10 a.m. Saturday, March 14, at the Winona Lake Grace Brethren Church.